Just to illustrate that even a number of those florid, beautiful and seemingly innocuous passages within (That's) Amoris (!) Laetitia contain serious misrepresentations of Catholic Truth, see the above quote delivered to us by Word on Fire, Bishop Robert Barron's resourceful channel for evangelisation. This is a teaching document. Because it comes from the hand of the Pope it is, even if presented pastorally meant to be a Catholic teaching document. The more I read of Pope Francis's writings, the more I think he is good at talking about climate, or poverty, or even aspects of economics and social science, but not so adept at teaching about Catholicism. Firstly, note how the Church's usual language has been seriously co-opted and compromised. The Church rarely, if ever, in Her encyclicals has talked about people 'in love'. 'In love' is the World's language that we Catholics may use periodically from time to time to express a personal state in a relationship. Find me another exhortation that talks about couples being 'in love'. Search through even the teaching of 'Theology of the Body' and I'm pretty sure that St John Paul II will have deliberately omitted such surface level worldly descriptions of authentic human Christian love. Secondly, note how instead of the customary term, 'spouses' or even (controversial though I know such language nowadays is) terms such as 'husband and wife' we find the vividly secular replacement of 'two people'. We assume that Pope Francis is talking about traditional marriage and about spouses, about a husband and a wife, but because such language is too 'traditional' or even 'exclusive', in an age in of increased 'gender equality', widespread cohabitation and homosexual relationships some could wonder whether the 'two people' need necessarily be one man and one woman. It is left horribly vague in this age of gender and relationship 'fluidity'. I write this not necessarily to impute some kind of mischief on the part of the author but to point out that talking about love and marriage and family while dispensing with the Church's traditional language and preferring instead the use of the world's 'terms and conditions' has serious consequences and can create even casualties. As Orwell said of war, the first casualty of this approach is truth. Having married a woman during a nuptial Mass in the Extraordinary Form, though the vast majority of it was in Latin, I recall the vows that I made. I know what was asked of me and what the Church exhorted me to do. We all know what the Church's true exhortation to married couples is a call to lifelong fidelity, constancy, openness to life, exclusivity, giving children a Christian education, etc. I say "etc" loosely, but whatever is entailed in the "etc" I am pretty sure 'helping each other to become more of a man and more of a woman' is pretty low down that list. Marriage vows are like an iceberg, one priest told me, in as much as when approaching it, you don't see the whole thing, but only what's above the surface of a deep ocean. When you get married, you get to see what an iceberg really is and how deep it is. No wonder then, that so many, ill-prepared, find themselves in our superficial modern age so quickly shipwrecked. But back to 'the mission' of marriage. 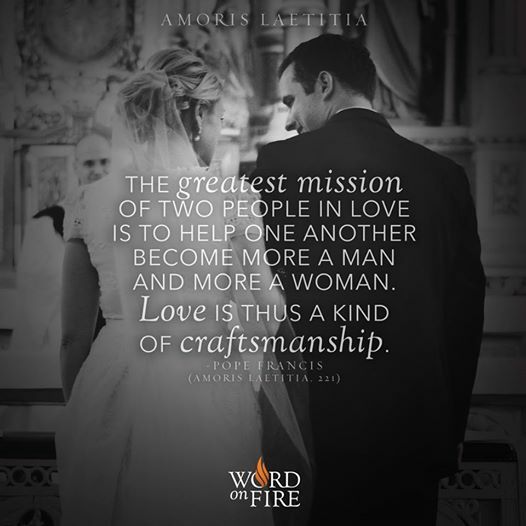 In fact, I am quite certain that the greatest mission, indeed, the mission of the married couple, is to help each other attain to the perfection of Christian holiness and virtue in this life, aiding each other in Christian charity to reach - by co-operating with the sanctifying grace that Holy Matrimony confers upon the spouses, along with frequent reception of the Eucharist and Confession, the joys of Heaven. Every other blessing within marriage, including the blessing of children and the responsibility of raising them to love and reverence God will count for little if a married couple lead each other through malice, ignorance, infidelity and final impenitence, into the everlasting punishments of Hell. These accomplishment of these excellent duties will flow from a holy life of mutual love and fidelity to Christ. Through obedience to Christ, married couples help each other to save their immortal souls. Pope Francis's quote above is very sentimental, even endearing, but it is not actually true. Now, it may well be that as part of the bi-product of a good and holy marriage, a couple do indeed become 'more a man' and 'more a woman' (let's assume, for Pete's sake, that this is within the original gender to which the individuals have been, in modern parlance, 'assigned'), yet it is not the mission of marriage and it is certainly not worthy of taking the superlative. There are indeed other aspects to the mission of marriage, such as evangelising through giving witness to the inestimable gift of Christian marriage, the joy and happiness that it brings, in a world beset by many evils that cause harm and despair, even amid trials and the various challenges the demands of marriage set before spouses, especially in our permissive age. Yes, there are demands that Marriage makes on spouses. Yes, couples do not always faithfully replicate the perfect love manifest in the mystery of Christ's relationship with His Bride, the Church. However, that high standard is what married couples are called to and it would be terrible for anyone to give the impression that to ask for perfection in mutual charity is not possible and attainable when Christ Himself has said, 'Be ye therefore perfect, even as your Heavenly Father is perfect'. 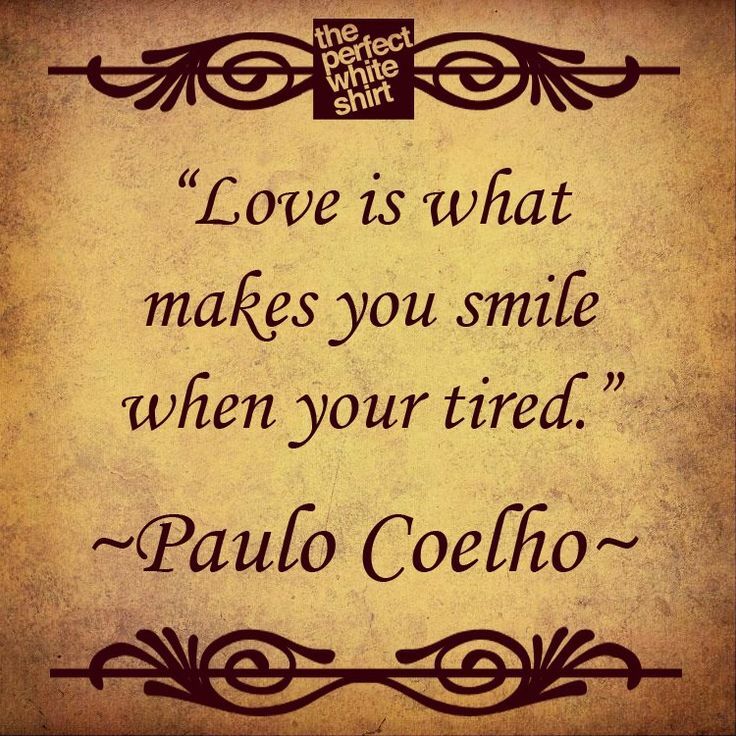 By the time we examine whether platitudes such as 'love is a kind of craftsmanship', we wonder whether we have moved out of Papal exhortation zone and into the world of Pablo Coelho. Love is a commandment of God. Charity is also a fruit of the Holy Spirit at work in a Christian. God is the potter and we are the clay. Christ is at the centre of marriage and in a successful marriage, Christ is enthroned over the spouses and He oversees its success. A successful marriage is nothing but a faithful marriage. Above all, though you would never tell from Amoris Laetitia, marriage is sacred and holy. He who violates marriage, violates the Church which is Christ's Bride! Marriage, to be sure, chisels away at our selfishness and our pride and forces us to live for another, regularly putting self to one side and turning to God and our spouse. It is also humbling because we are regularly confronted by our own weakness and lack of virtue. God it is who makes Saints out of this glorious and august Sacrament. Spouses, whether they are 'in love' or not, work with Him when they love Him and show their love of Him, in their profound and authentic love of their spouse. That might very well enable a woman to help a man to become more of a man and a man to enable a woman to become more of a woman, but the goal of marriage is much, much higher than simply that. Too often, in this pontificate, the horizon which Pope Francis points out to us is clipped, missing that element of supernatural life and eternal life, the ultimate gift and goal of the Christian. Married couples - all the baptised - are called to be Saints, nothing more, nothing less, destined for eternal life with the blessed who see God face to face in Heaven. Pope Francis, like all in authority in the Church, is called to point us to Christ, to point us to Heaven. Please God, may he strive to do so. May he begin to point us to Heaven. I agree with you. You are far more charitable towards this document and its author(s) than I am. When,oh when will the Bergoglian Heresy end? Souls are tumbling into Hell and the Conciliar Church condones infidelity and Mortal Sin.Pray for the end of this Papacy.God Bless. Interesting that you mentioned Paulo Coelho. He is absolutely detested in Brazil, since he cannot write. His reviewers suffer horribly trying to get sense out of his words. He is a fake. And Bergoglian heresies also have no depth. Let us pray, pray, pray that this thing ends as soon as God wills it. Your reflections on Catholic marriage are beautiful. You should be a catechist. Or better yet, a papal ghostwriter.